We know what an A-Rig is but what is a funnel? The funnel is a BBZ term describing aquatic locations which provide predator fish with a feeding advantage. Much like a military ambush zone that uses the terrain to gain the upper hand, prey becomes compromised when it enters a funnel. Based on the predators position the prey's movement and escape routes are limited and their response to being trapped in the funnel is predictable. Paul Elias with the Money Maker. A funnel can be comprised of many items, both structure and cover elements. These elements include the water's surface, the shore line, the lake bottom, a bluff wall, a boulder, a bush, a dock piling or even your boat. There are too many to name them all. Funnels which feature a combination of both structure and cover elements can be superior. These locations are often referred to as the spot on spot. 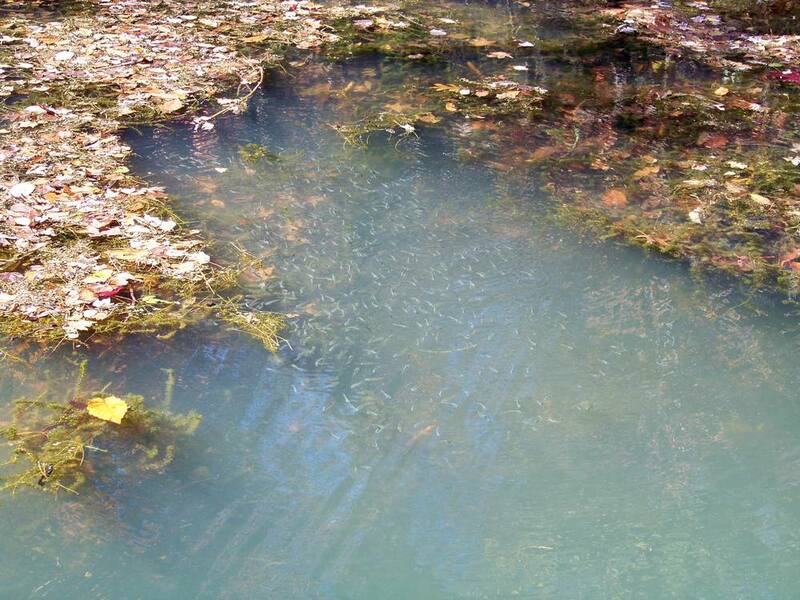 Shad Forage Fish Positioned Against a Funnel Composed of the Aquatic Vegetation and the Surface, Trapped! There are many funnel types and some funnels actually move. A 'ball' of forage fish is also a funnel. Predators in many ways will benefit from a bait fish school. By flushing or corralling and forcing them to the surface or against some type of object a feeding advantage is created. The school itself becomes a funnel. Hit The Funnel, 4" BBZ Lavender Shad Swimbait After Passing Through a Moving Funnel! When presenting deceptions to fish, leading them into a funnel as opposed to drawing them away from one can be the difference between a fish that follows and a fish that strikes. 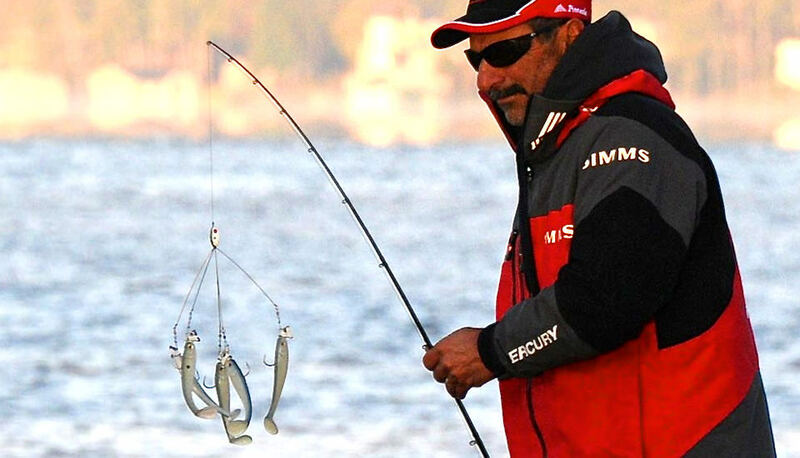 Casts that land just past a surface boil are usually superior to a cast that lands short of top-water action. Are you coming to them and entering the funnel or are you asking them to chase out into open water away from the funnel, for the predator which is easier? Understanding how and why funnels work also provides insight as to why the A-Rig is at times so extremely effective. A-Rigs by featuring multiple bait fish imitations create the illusion of a small forage school. During the retrieve Alabama-Rigs are also a moving funnel. 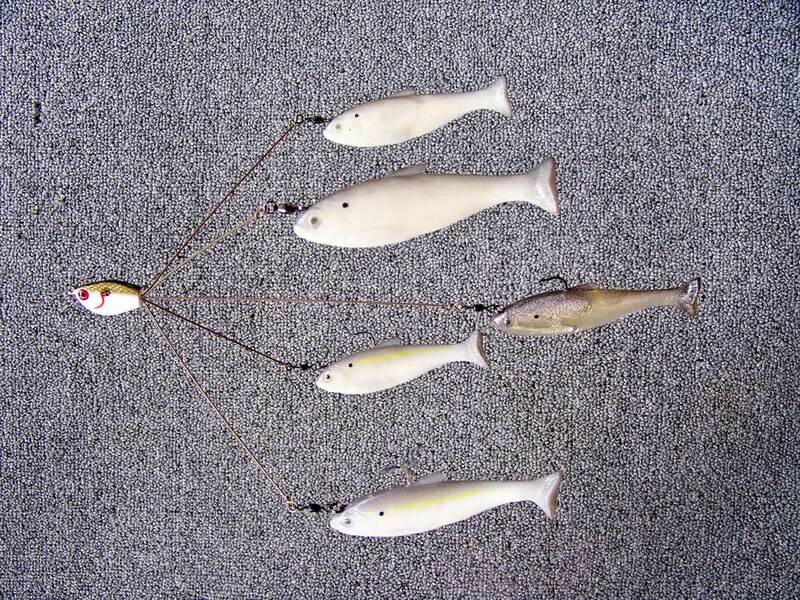 A Moving Funnel, Dependent on the Baits the A-Rig is a Harness/Delivery System. While watching a major fishing tournament on TV I listened to the account of a perplexed swimbait angler. He stated that while moving down a stretch of shoreline throwing his single boot tail soft plastic hollow belly swimbait he would generate no strikes. This competitor went on explaining that an A-Rig angler would come right behind him and catch a bass in the same spot he just fished . Why, my answer is perhaps with his single swimbait, he didn't enter a funnel properly, yet no matter where you throw the A-Rig a funnel is automatically present. A-Rigs have a lot of drawing power and if you place them into a stationary funnel, then you have a funnel within a funnel. In doing so you have dramatically increased your odds for success, the plus factor is extremely high and there is absolutely a reason why! Funnels, always look for them, if you use them properly they will significantly increase your catching power regardless of the lure or the technique. Tony Lain and the Chicken Rig, BWWK BWWK!